aged cheese, from grilled meats to complex sauces. 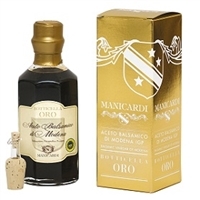 5 Year Aged Balsamic Vinegar Margai Condimento - 5lt/1.3gal. 12 Year Aged Balsamic Vinegar Margai Riserva - 5lt/1.3gal.